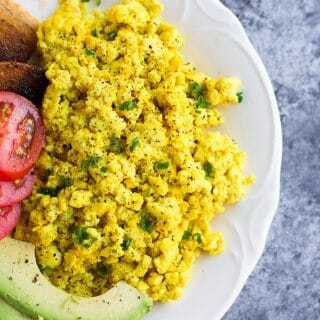 The BEST Tofu Scramble! 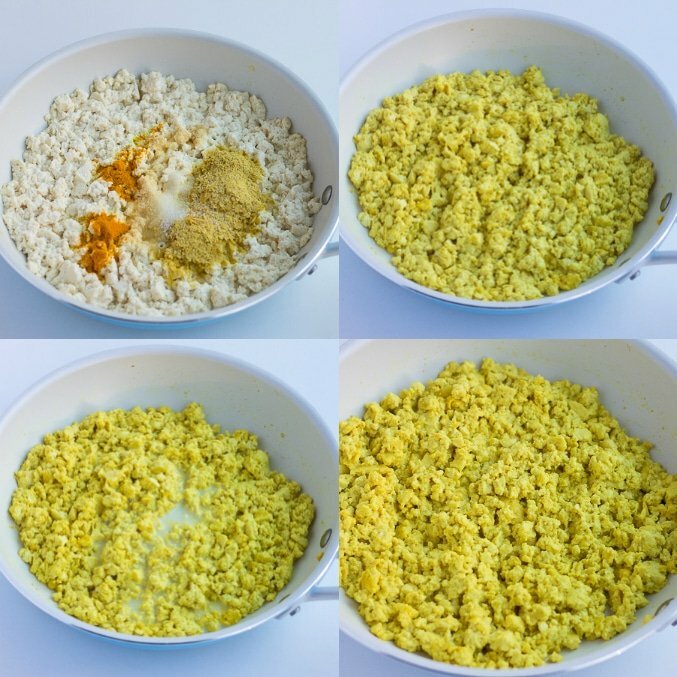 If you miss scrambled eggs, this one’s for you. Just 7 ingredients, 10 minutes and 1 pan required! I don’t know about you, but I used to really enjoy scrambled eggs as a kid. At some point, maybe around 10 or 11 years old, I learned what an egg actually was, and was rather horrified. After that, my relationship with eggs was tainted and I rarely ate them. Eventually, I went vegan and never looked back! However, I still remember the taste and enjoyment around eating scrambled eggs. So if you’ve been there too, or have recently gone vegan, I hope you enjoy this recipe! 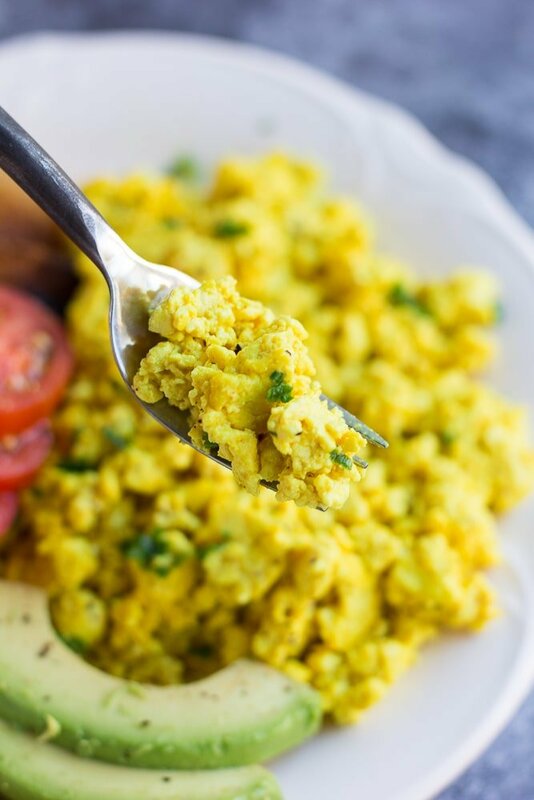 This tofu scramble really hits the spot for me, and I’m sure it will for you as well. 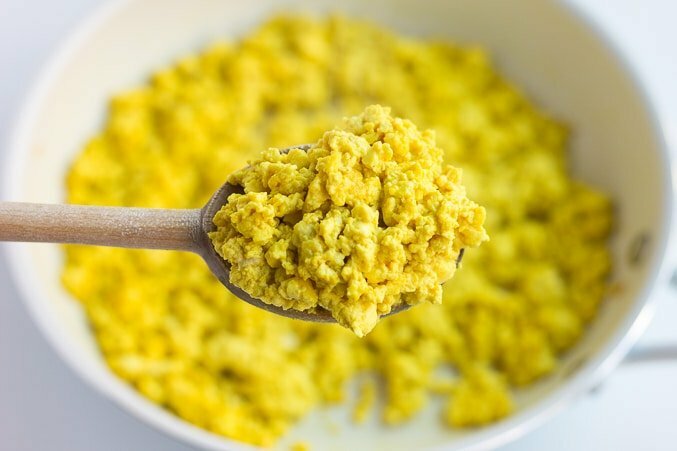 What kind of tofu is used for tofu scramble? I prefer using firm tofu. Extra-firm is fine as well. 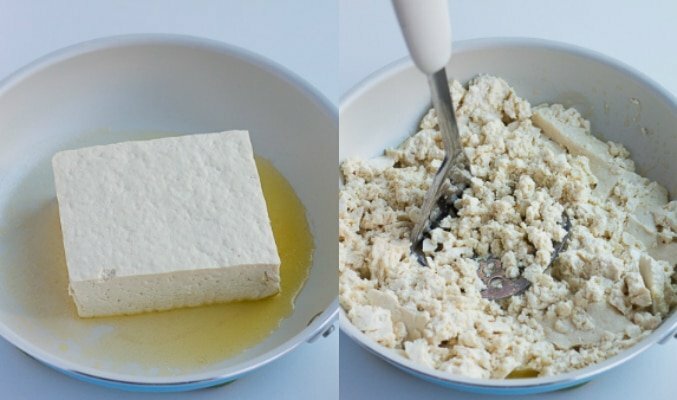 There is no need to press your tofu for this recipe; the water will cook out in the first couple of minutes. Add a tablespoon of olive oil to a pan and warm it over medium heat. To crumble the tofu, I place the tofu in the pan, then mash it with a potato masher. That’s my preferred method, but you could also simply crumble it into the pan with your hands, or mash it with a fork. Cook it, stirring frequently for 3-4 minutes. Next, add the nutritional yeast, salt, turmeric and garlic powder and cook for about 5 minutes, stirring. Pour in the non-dairy milk and stir. Serve immediately! What vegetables can I add and how should I do it? 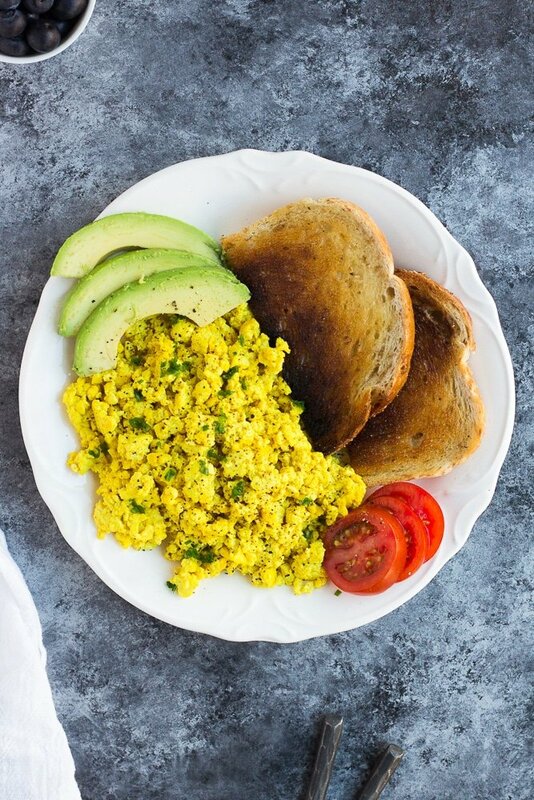 I love to serve this basic tofu scramble with sliced avocado, hot sauce and toast. But you can also play around with it and add many different vegetables. Be creative! 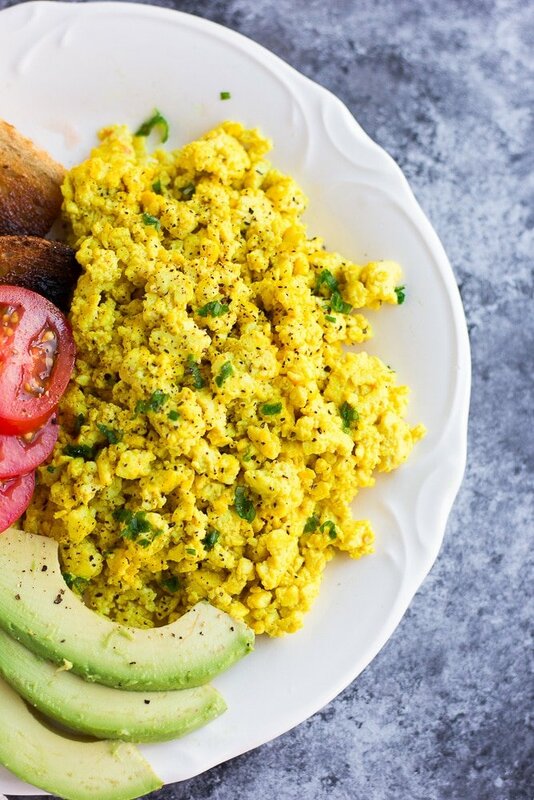 This tofu scramble is super kid-friendly as well. My 3 kids all reject a tofu scramble with real onions and veggies added, but this simple one they absolutely adore. My 3 year old gobbles it up like there’s no tomorrow! 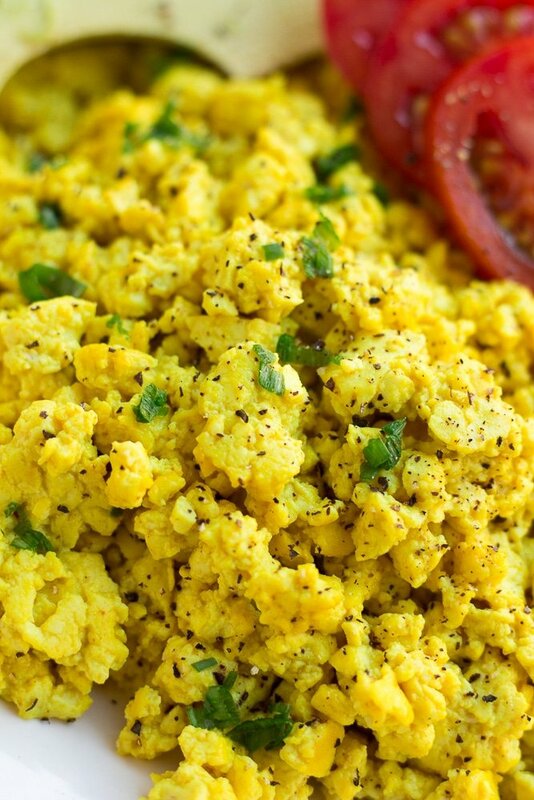 What other breakfast recipes go well with tofu scramble? I would say it lasts about 3 days in the fridge. After that it gets a little funny. But honestly it doesn’t make a lot so I can’t imagine it will last that long! Double the recipe for the whole family or to have breakfast for a couple of days. 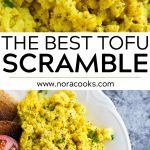 The BEST Tofu Scramble! If you miss scrambled eggs, this one's for you. Just 7 ingredients, 10 minutes and 1 pan required! Heat the olive oil in a pan over medium heat. Mash the block of tofu right in the pan, with a potato masher or a fork. You can also crumble it into the pan with your hands. Cook, stirring frequently, for 3-4 minutes until the water from the tofu is mostly gone. Now add the nutritional yeast, salt, turmeric and garlic powder. Cook and stir constantly for about 5 minutes. Pour the non-dairy milk into the pan, and stir to mix. Serve immediately with sliced avocado, hot sauce, parsley, steamed kale, toast or any other breakfast item. Tofu Scramble is also good with all sorts of vegetables mixed in. Vegetables to add before the tofu: 1/4 cup diced onion or a few cloves of minced garlic. Saute in the oil for 2-3 minutes before adding and mashing the tofu. Vegetables to add towards the end: fresh spinach, kale, thin sliced red peppers, small chopped broccoli or fresh sliced/diced tomatoes. Add these after you've added the milk to the tofu, and cook for just a few minutes. Omit oil if desired to make the tofu scramble oil free. You can use any kind of non-dairy milk you like, such as soy, almond, cashew, oat or coconut milk. Just make sure it is unsweetened and unflavored.